W. W. Norton & Company, 9780393066821, 520pp. From Bible Belt to Sun Belt tells the dramatic and largely unknown story of "plain-folk" religious migrants: hardworking men and women from Oklahoma, Texas, and Arkansas who fled the Depression and came to California for military jobs during World War II. 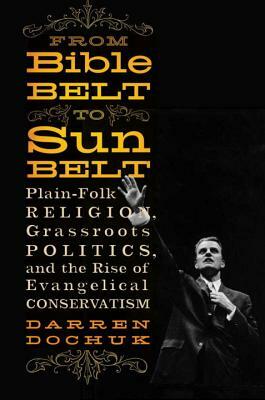 Investigating this fiercely pious community at a grassroots level, Darren Dochuk uses the stories of religious leaders, including Billy Graham, as well as many colorful, lesser-known figures to explain how evangelicals organized a powerful political machine. This machine made its mark with Barry Goldwater, inspired Richard Nixon's "Southern Solution," and achieved its greatest triumph with the victories of Ronald Reagan. Based on entirely new research, the manuscript has already won the prestigious Allan Nevins Prize from the Society of American Historians. The judges wrote, "Dochuk offers a rich and multidimensional perspective on the origins of one of the most far-ranging developments of the second half of the twentieth century: the rise of the New Right and modern conservatism.